"After testing many recipes for cinnamon rolls I found that just about any home-made roll can be good if you have the right icing. In too many recipes the cream cheese flavor overpowers the icing. Use this recipe for decadent cream cheese icing on your favorite cinnamon roll and you won't be disappointed!" Beat together the cream cheese and butter with an electric mixer in a large bowl until creamy. Mix in the vanilla and milk, then gradually mix in the confectioners' sugar and salt until smooth and fluffy. If your cream cheese and butter are cold, it won't cream well. Microwave each separately for about 10 seconds and they will be soft enough to work with. I like icicing which is fluffy and less thin. This icinig is not creamy but almost the consistency of gloss. I would decrease the liquid next time and also use a little less butter. 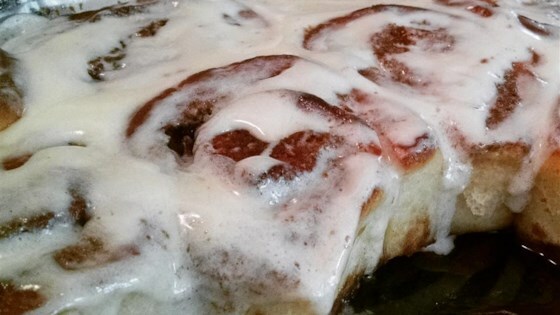 Perfect title for the "Perfect Cinnamon Roll Icing". My family loved it. I thought it was delicious! I didn't change a thing! And I still loved it! Perfect! very good recipe! I only added 5 tablespoons of butter and used 3 oz cream cheese since I just used the whole package. Perfect for cinnamon rolls!!!! !